Rachel Daniels is a young musician excited to bring her passion for performing, teaching, and local outreach to Kansas City. For Rachel, classical music is a way to bring people together. From performing intimate classical concerts to teaching private violin lessons and leading educational programs, Rachel uses her musical expertise and training to create meaningful connections within her community. 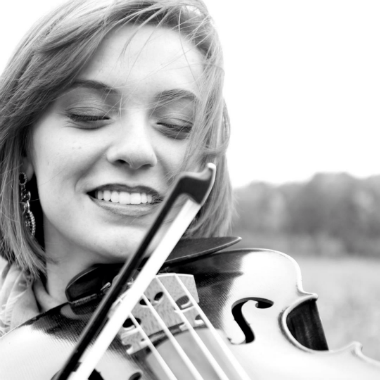 Having earned a bachelor’s degree from the Oberlin Conservatory of Music and a master’s degree at the Rice Shepherd School of music, Rachel has studied viola with renowned teachers Peter Slowik and Ivo-Jan Van der Werff. With extensive orchestral training and experience, Rachel was previously a member of the Madison Symphony Orchestra and a substitute with the Milwaukee Ballet Orchestra. She has also served as the assistant-principal viola with the Oberlin Orchestra and the Shepherd School Symphony Orchestra.As a chamber musician, Rachel has studied with members of the Dover, Pacifica, and Arianna string quartets, as well as touring in the Lincoln Center Stage resident piano quintet aboard the Holland America cruise line. Internationally, Rachel has performed in England, Italy, Canada, Austria, and the Czech Republic. She has held fellowships with the National Orchestral Institute, the Spoleto Festival USA, the Madeline Island Chamber Music Festival, and the National Music Festival. Other summer music programs she has attended include the Aspen Music Festival and School and the Chautauqua Music Festival. Rachel has had the privilege of mentoring many students, ages 5-60 on their musical journeys. As a Suzuki violin/viola trained teacher, she views music lessons as a chance to not only learn an instrument, but to help children and adults alike achieve goals, learn to self-evaluate, and find their artistic voices. Particularly for very young beginners, Rachel encourages a close bond between parent, teacher, and student. Rachel has had tremendous success in building meaningful connections with her students as they grow. She has also coached chamber music at the Oberlin Community Music School and served asan orchestral coach at the Milwaukee Youth Symphony Orchestra. Rachel believes that music and communities should be deeply intertwined. As such, she has coordinated and performed in several different concert series as relief efforts and educational programs. Sheproduced a concert series in a number of different shelters during the aftermath of the devastating Hurricane Harvey in Houston, TX. The concerts focused on sharing music to remember the ongoing needs ofthose still suffering after the damage to the city. As a part of the children’s outreach series, “Just for You Music Program” at the Rice Shepherd School of Music, Daniels curated and coached a series of programs for under-resourced children that focused on teaching how to engage with sound. Rachel continues to dream of future communityprograms involving the power of music to heal, educate, and inspire. Also a contemporary music lover, Rachel has participated in a number of recordings and collaborations. She can be heard on the Oberlin Recording Label with the Contemporary Music Ensemble. She also performed in the premiere of Kenji Bunch’s “Rise and Shine” at the American Viola Association convention. Other premieres include Teddy Niedermeier’s “Morning Star”. When not performing or teaching, Rachel can be found cooking, doing yoga, scuba diving, and reading novels alongside her husband.